The Berlin conductor Otmar Suitner had two families: one in the East, one in the West of the divided city. Sixteen years after the Wall came down he had to retire, the music has disappeared from his life. 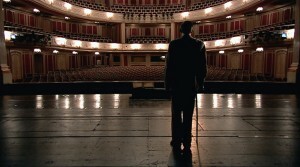 This film is the son's journey to the father, discovering his art and exploring the hidden sides of their family story. Father and son travel together for the first time to find out what is left after the music. Igor Heitzmann was born in 1971 in Rendsburg. After studying Piano and Theater Studies, he worked as an assistant director, script editor, translator and production assistant for Medias Res/Berlin. He then took up studies at the German Academy of Film & Television (dffb) in Berlin from 1995-2006. His films include: Insanity Increasing (short, 1996), Anthropophobia (short, 1997), La Petite Mort (short, 1998), Family (short, 2000), Runaway (short, 2002), and A Father’s Music (2007).